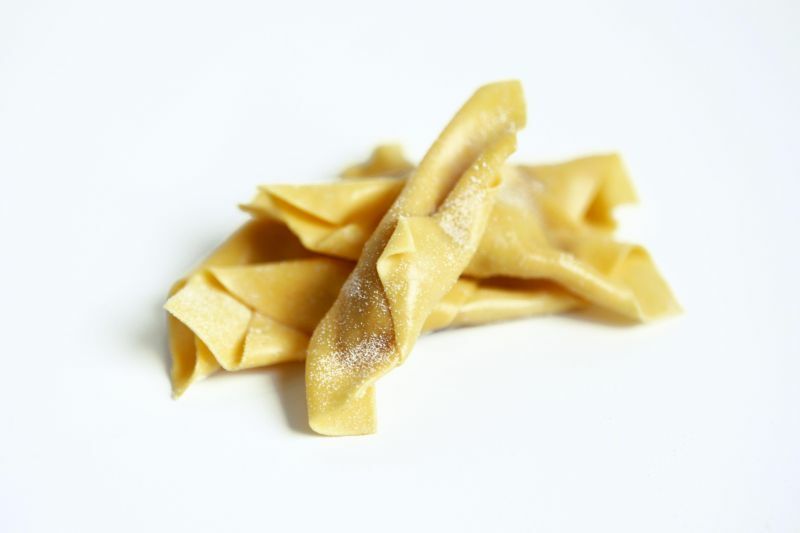 Casoncelli are kind of stuffed pasta, typical of the culinary tradition of Lombardy, in the north-central part of Italy. The shell typically consists of two sheets of pasta, about 4 cm long, pressed together at the edges, like that of ravioli. Alternatively it is a disk folded in two and shaped like a sweet wrapper. Casoncelli in the style alla bergamasca are typically stuffed with a mixture of bread crumbs, egg, parmesan, ground beef, salami or sausage. Variants of filling include spinach, raisins, amaretto biscuits, pear, and garlic; while the casoncelli alla bresciana are stuffed with a mixture of bread crumbs, parmesan, garlic, parsley, nutmeg and broth. They are typically served with burro e salvia: melted butter flavored with sage leaves. Recipe using Casoncelli see Here, Here and Here.